This small hotel—just 62 rooms—is on the Embarcadero waterfront facing the San Francisco Bay, walking distance to the Ferry Building Marketplace and the Financial District (there's a complimentary town car as well). The city's vintage street cars run up and down the palm-lined street and the Bay Bridge puts on a spectacular light show every night: ask for a Bay View suite to see it from your room. The Hotel Griffon’s brick façade opens to a lobby full of color and art-nouveau details: look for glass and ironwork lamps over the bar. Exposed brick and opulent gold tones create warmth in the rooms. Internet access is free, and bathrooms come with fluffy bathrobes. Keep fit on the road: guests of the hotel have access to everything from swimming to Pilates at the nearby, 55,000 sq. ft. YMCA. Perry’s on the Embarcadero serves modern American cuisine (Ahi Tacos, Filet Mignon) indoors or on the sidewalk patio facing the Bay. A boardroom accommodates up to 14, with state-of–the-art technical equipment and catering services available. 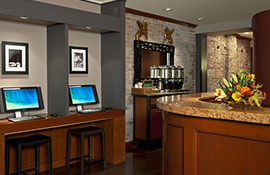 The hotel offers easy access to the financial district and AT&T Park. Union Square shopping, SFMOMA and the Mocone Center are about a 5 minute cab ride away. Cancel by 24 hours prior to arrival date.